Hello-Hello, we hope the sun is shining as brightly in your corner of the globe as it is here! We begin with an apology to those not fond of fashion-laden posts, we must beg your indulgence one more day, as we have yet to share the images from another big do. The Met Ball was Monday night, arguably the season’s most important event for seeing, and being seen, in serious formalwear. (The official name for the event: the Metropolitan Museum of Art Costume Institute gala.) The evening also officially kicked off the Museum’s special exhibit, American Woman: Fashioning a National Identity. For decades the Gala has been overseen by Anna Wintour. The Vogue magazine editor was in an ensemble by Chanel Couture; some found it less than attractive, but we actually liked the look, and thought it was flattering on Ms. Wintour. Two of the evening’s most elegant looks: Jennifer Lopez in Zuhair Murad. And Marion Cotillard in glittering Christian Dior. They are both wearing what we refer to as “SPFs,” Serious Party Frock. The editors at Refinery 29 came up with this group of “Best Dressed” ladies at the Gala. From the left, Zoe Saldana in Calvin Klein, Kate Bosworth wears Valentino, Rosie Huntington (apparently a popular model) in Burberry and Emma Watson, also in Burberry. The event is A List only; below we see Lauren Bush and David Lauren, on the right, Ricky and Ralph Lauren. In an unusual twist, we thought the younger generation’s styles were superior to those seen on their elders; the blue jeans looked horribly inappropriate. Below left we show Dylan Lauren, and on the right, Tommy Hilfiger and his wife, Dee Ocleppo. Taylor Swift was in Ralph Lauren Collection, and Tory Burch in Tory Burch. From the Gossip Girl contingent, Blake Lively wears Marchesa and Jessica Szohr in Versace. Leighton Meester and Penn Badgley were also on hand. “… all the relationship drama has made the cast of Gossip Girl skittish around reporters, because Penn Badgley, Jessica Szohr, and Blake Lively each didn’t so much as turn their heads as they hustled up the stairs, surrounded by flacks, and went inside. And how did Ms. Lively look for the after-party? Below left we see the more casual look she sported, and on the right, co-stars Penn Badgley and Chace Crawford at that function. We were not crazy about Ivanka Trump’s Atelier Versace dress, nor did we think highly of the Chanel look seen on Kristen Stewart. We also struggled with someone we generally adore seeing in a fab frock, Mad Men’s Christina Hendricks; this blue gown simply didn’t work. The black and white gown on Malin Akerman was another miss IOHO. One dress creating quite a stir (and also making it onto almost every ‘worst dressed’ list), Katy Perry’s LED light-up dress. Also seen with Ms. Perry in the dubious distinction category above, Chloë Sevigny in Proenza Schouler, Tina Fey in a jumpsuit of unknown origin, and another Mad Men fave, January Jones. Ms. Fey and Ms. Jones surprised, they usually appear far better put together. In a new category we are calling “Worst Gown by Volume,” model Coco Rocha and her Zac Posen. That is the soon-to-be-released Preppy Pink Mini from HP, a thing of beauty. The Mini 210 is technically a netbook, not a laptop, and while we aren’t crazy about the pink keyboard, we are gaga for the overall design. 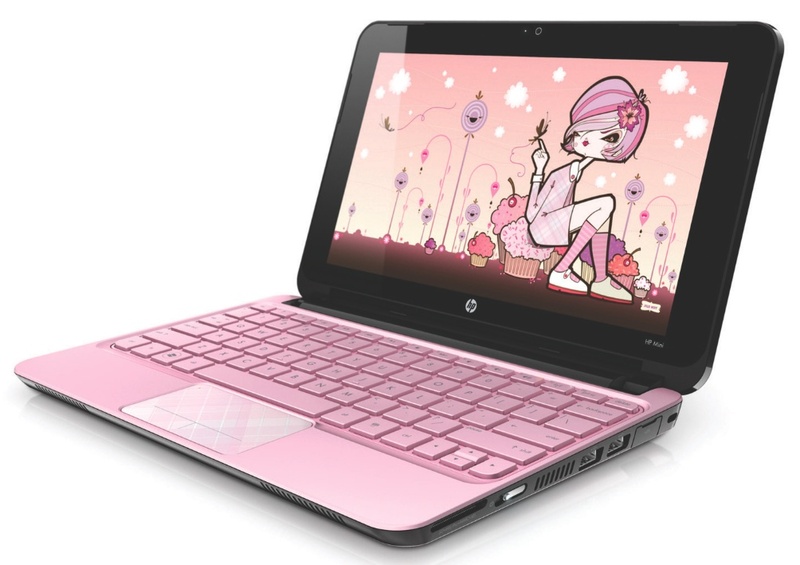 The HP Mini 210 in Preppy Pink (it will also come in “white crystal”) launches June 15 in the USA with a $355 price point. Click here to register for availability notification from HP.